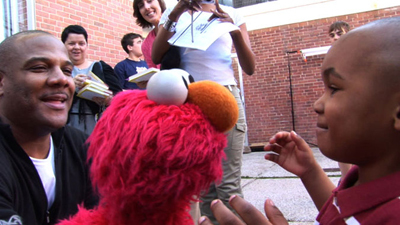 Being Elmo: A Puppeteer’s Journey (New Video) — Do you have a heart? Does it beat? Do you breathe? In and out? Then there’s pretty much no chance whatsoever that you won’t be 100% charmed by Constance Marks’ documentary about puppeteer Kevin Clash, whose lifelong passion has resulted in one of the world’s most iconic furry creatures: Elmo! But what makes this film so special is that it proves that by working hard, being personable, and sticking to one’s chosen path, one’s wildest dreams can, in fact, come true. Available on DVD . Tyrannosaur (Strand Releasing) — Tyrannosaur is violent in every sense of the word. Fights break out, windows are smashed, emotions seethe. Writer-director Paddy Considine (better known as an actor from such films as In America and the Red Riding trilogy) wastes no time in establishing that his film could erupt at any moment, making it tense even at its most seemingly placid. Read Michael Nordine’s full HTN review. Available on DVD . Cook County (Hannover House) — Anson Mount gives an authoritative performance in this Super-16mm shot indie drama about the dangers of meth (if you weren’t aware, selling and especially doing meth tends to not end well). Available on DVD , Blu-ray , and Blu-ray/DVD + Digital Copy . The Double Hour (New Video) — Giuseppe Capotondi’s taut Italian thriller is one of those films that flew under the radar when it was released theatrically for some reason—too subtitled for the mainstream crowd? too genre-infused for the art house crowd?—which makes it ripe for discovery by both sides on home video. Available on DVD . Chinatown (Paramount) — Roman Polanski directs Jack Nicholson in this unheralded, little-seen… just joshin’. Available on Blu-ray . War Horse (Touchstone/Disney) — Available on DVD , 2-Disc Blu-ray/DVD Combo , 4-Disc Combo: Blu-ray/DVD + Digital Copy , and at Amazon Instant . We Bought A Zoo (20th Century Fox) — Available on DVD , Blu-ray/ DVD + Digital Copy , and at Amazon Instant .